Evans was an armed robber before he elevated himself to a kidnapper who collected millions from his victims. This photo above shows the scar on his shoulder which came from the injury he sustained during a 2006 bank robbery in Lagos. He made this confession to police according to The Nation. He said in the interview that him and his gang members started shooting themselves at the National Theatre in Surulere, Lagos after they robbed a bank in 2006 and got into a disagreement while sharing the loot. He said some of his gang members died in the gun fight but he was seriously injured. 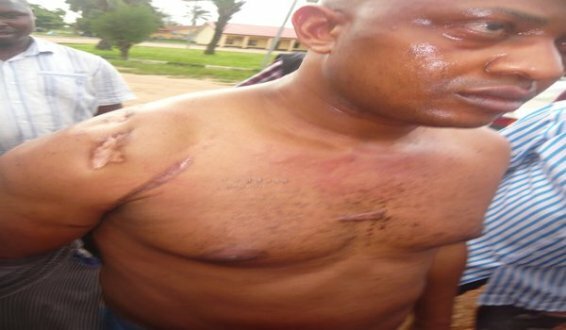 0 Response to "Check out the gunshot scar kidnapper Evans got after a 2006 Lagos robbery (Photo)"